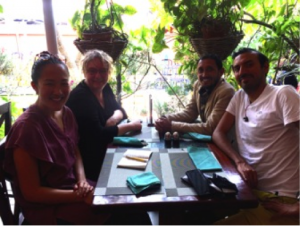 Today Olivia Biermann and Antonio Beltran from Foundation Human Nature (FHN), Netra Karki and myself met in Kathmandu to discuss further collaboration, to be updated about the current situation and to plan for the future. 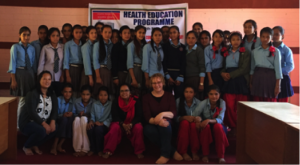 Today Dr. Diksha Pokhrel from Kathmandu Medical College joined us to the village to perform the first follow up’s last focus group discussion with the remaining teenage test group girls. The results are so far very positive and we have now started planning for the next step in this project. I’ve today distributed the first 10 menstrual cups for grown up women, all part of the Thokarpa Mahila Group that has been so supportive and helpful within the teenage girl menstrual cup project. These women will not be included in the menstrual cup study, but are to be followed up by myself in a more informal setting as we regularly meet in the village. 20 out of in total 130 houses in Thokarpa build with the earth brick technique are to be found in the very poor Dalit community Dadha Gaun we visited today. 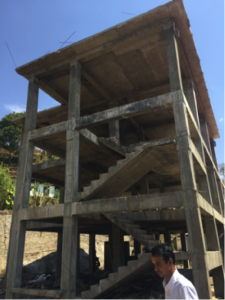 Each house is being built with two rooms, kitchen, veranda, toilet and a second floor for storage of food and other things. 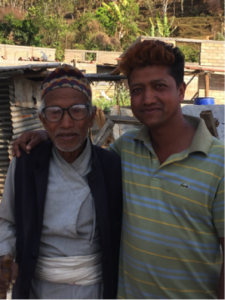 Lila Ram Nepali and his 85-year old father proudly showed us around. 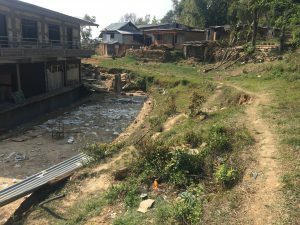 After the earthquake, the water situation in Thokarpa got unquestionably worse then it used to be. Several previously used water sources cracked, got contaminated or dried out. 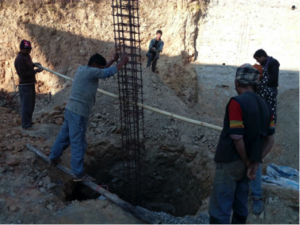 There is now a local water pipe project, with governmental support, going on in Thokarpa since about one year. The plan is for this water is to supply the health facility as well as the rest of the village centre with water all year around. The water is taken from a natural water source down hill and is planned to be piped from there, a distance of maybe a couple of kilometres. 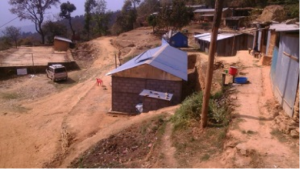 The water is pumped uphill exclusively with solar power, to then be piped to the village centre Bhag Bhairab. Today we visited one of the sites in the village, where this major work was to be seen. The health facility building is now impressively big with its three floors. It will now have the possibility of keeping 15 beds, staff room including kitchen for long term stay of KMC staff, conference room, dental service, lab, pharmacy, two opd rooms, one procedure room, toilets, room for registration and waiting areas, among others. 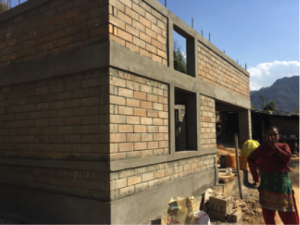 Approximately 15 000 bricks will be needed for the health facility and the work with producing those is going on continuously. All four brick machines are now running full time in different parts of the village. 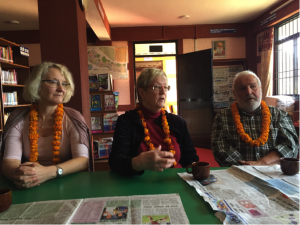 Today I’ve been in Thokarpa with two dear Swedish friends of mine, Marie Schön and Leif Bjellin, who have both been engaged in Nepal for decades. 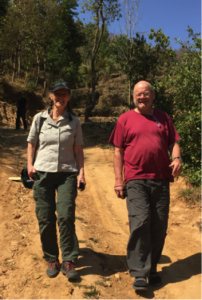 Marie and Leif both visited Thokarpa last year and now joined me for follow up. 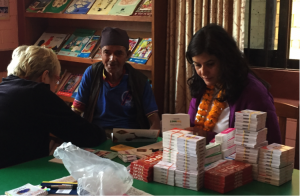 Today we were as well accompanied by Dr Diksha Pokhrel from KMC. We were, as always, warmly welcomed by, and spent the day together with Netra Karki and Shankar KC. 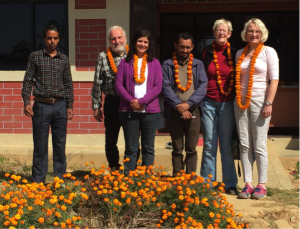 The Sweden Nepal Society board has decided to keep on doing fund raising for the Thokarpa Health Facility, even though the first commitment is finished. The next step will be to support with funds for medical equipment, but furthermore plans are in progress of supporting Thokarpa with dental service. There is a room available in the now three-stored health facility building for this. Kathmandu Medical College runs, besides medical- and nursing school a dental school. KMC’s has, when discussing this, been very positive to participate by bringing dentist and dental students to Thokarpa. Further discussions are to be held and no decisions are made at this point. 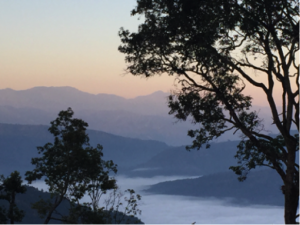 Yet, if possible to add dental service to Thokarpa in the future, it would be of significant importance for the health and well-being of about 25 000 people in this rural midhill Himalayan area. 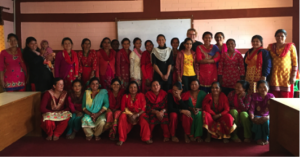 The Foundation Human Nature, FHN, supported program concerning menstrual cups for teenage girls in Thokarpa has been expanded to now be included in an academic collaboration study with Kathmandu Medical College in Kathmandu and Karolinska Institutet in Stockholm. Yesterday and today the first follow up after starting this four month long test phase for thirty teenage girls in Thokarpa was performed. 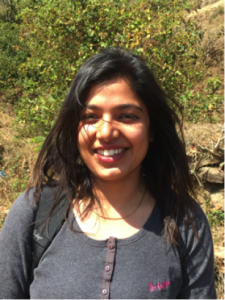 KMC Dr Diksha Pokhrel was responsible for holding focus group discussions with the girls in the village and the first results are now to be analysed. Our aim is to publish this study and these procedures are in progress. The first impression is that the menstrual cups have been received and used better then our expectations. 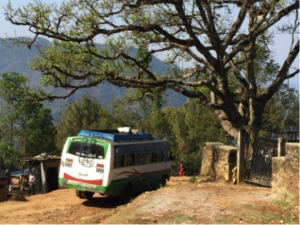 During the last six months Kathmandu Medical College (KMC), one of this collaboration’s main stakeholders, has been going to the village three times to perform field work, bringing around 30 medical students each time. 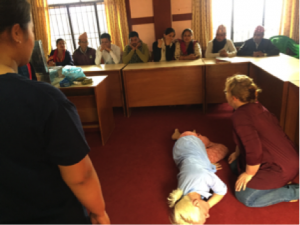 The KMC Community Medicine Department organizes this program as a part of the student’s basic studies in primary health care in rural Nepal. The students are accompanied by doctors and supervisors and have been staying in the village for a few days. This on-going fieldwork is a thorough intervention concerning the health status, as well as socioeconomic-, educational-, traditional-, and many other aspects in Thokarpa. 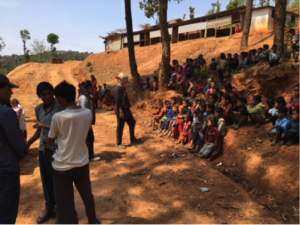 Besides thoroughly interviewing two families each, the KMC medical students have been running health education programs as well as additional health work in the village. This intervention fieldwork program is continuing and will act as an important foundation for future health related work in the village. The next KMC-Thokarpa fieldtrip with students are planned for April. The engagement from the local side is massive, well planned and well performed. 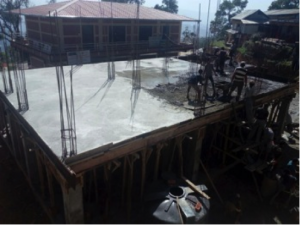 With the additional governmental grants, applied for by the Thokarpa VDC, it’s been able not only to expand the building with a third floor, but as well to start planning for fifteen beds for patients to stay, to be compared to our first planned two beds. The strong engagement from the VDC and other local stakeholders of course makes the light shine bright upon the possibilities to run and maintain this health facility over many years to come. Governmental money, through the Ward Office, for further construction financial support has been “on hold” for administrative reasons for awhile, but is now slowly in progress. 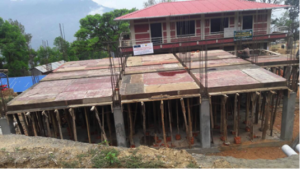 The governmental money Thokarpa VDC themselves has been granted, has made it possible to add still another floor. 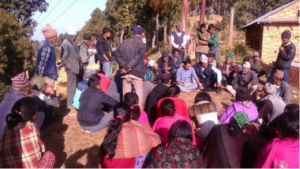 During the last year’s thorough and on-going work with raised awareness on health issues in Thokarpa, the village development committee (VDC) has decided that smoking and drinking alcohol in public areas in the village centre Bhag Bhairab will not be allowed. 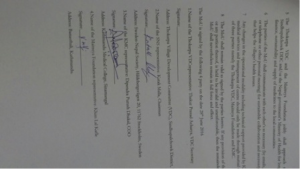 If anyone wants to sell alcohol, they will onwards need a permit from the VDC. Since some months there is as well a waste management program running, with the students in Bhag Bhairab Secondary School being responsible for cleaning up Bhag Bhairab every 15th day. During my last visit in Thokarpa, the students were busy working within this cleaning program. 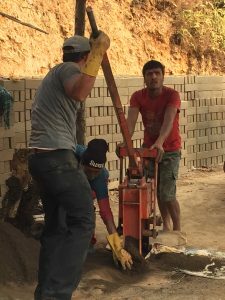 From the start of Tihar, the brick machine making bricks for the health facility has been on service in Kathmandu. The machine is now back and running in Thokarpa. 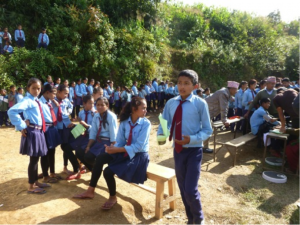 Half a year ago, I arranged for a first aid box to be handed out to Bhag Bhairab Secondary School in Thokarpa with 600 students. Up until then, no one of the five thokarpali schools have had any access to a first aid kit, neither any basic wound care nor written information on basic ABC for emergencies. Today the remaining four schools, Thokarpa Mabi Secondary School with 400 students, Daktakali Primary School 86, Kalidevi Primary School 75 and Bhalchichha Primary School with 100 students, were handed one first aid box each. All schools were as well given a basic instruction manual on ABC. I’ll personally onwards be responsible for follow up and refill of the boxes. Today we’ve had a successful start of the FHN supported program concerning menstrual cups for teenage girls in Thokarpa. 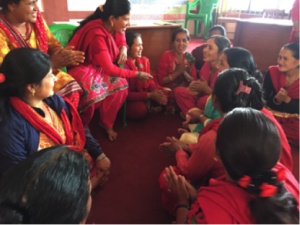 The preparation for starting the test group of thirty teenage girls, has from the village’s side been very well planned and done in great collaboration with Shankar KC, Netra Karki, the health workers and the teachers. Today’s program started with a thorough health worker held education program for the girls chosen for the test group, follow by added information and hand outs from my side. 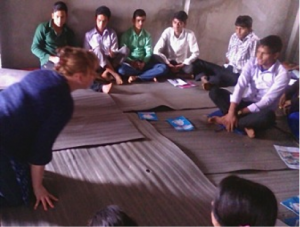 Beside the menstrual cup, the girls were given a soap and an instruction manual translated to Nepali. FHN and myself will in four months be back for the first thorough evaluation, to decide if to go on with the rest of the thokarpali schoolgirls. We as well onwards hope to be able to provide adult women in Thokarpa a menstrual cup for a reduced and affordable price. In collaboration with Foundation Human Nature (FHN) I’ve today been in Thokarpa to discuss and possibly introduce the idea of menstrual cups. This will be a project concentrating on teenage girl’s health situation during their period. It will as well be a part of a raised awareness focusing on that the girls, for practical reasons more then traditional, regularly have to stay home from school during this time. The idea of trying menstrual cups in the village was amazingly well received by the group of women in leading positions that was called to the introduction meeting today. This leading group of women have given their full support, as well as the VDC Chairman, the one in charge of the ongoing health projects and the school principal. Next step will be a four month long test phase for twenty teenage girls, before FHN decide if to go on with offering Thokarpa’s all school girls one each. 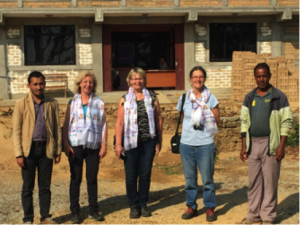 Today we’ve had three professors from Linköping University, Sweden, visiting the village, prof Inger Rosdahl, prof Sivert Lindström and prof Karin Öllinger. 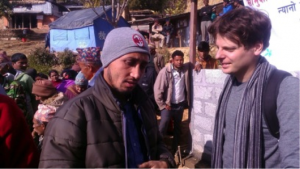 Shankar Khatri, who is now the Thokarpa health project coordinator, had together with Netra Karki the group introduced to the ongoing work in health projects, brick technique, the different library sections and school building projects. During our visit to Thokarpa today, we had the pleasure to be joined by two highly experienced dermatologists, who together held a minor skin health camp in the village centre. 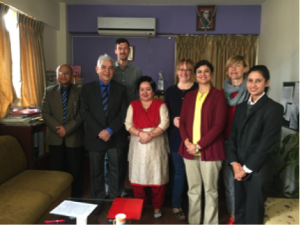 Around forty patients with various kinds of skin problems met our senior consultants prof Sabina Bhattarai from KMC, Kathmandu and prof Inger Rosdahl from Linköping University, Sweden. Free medicines were handed out. 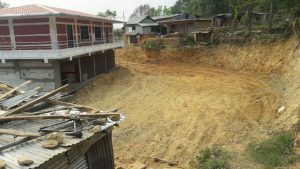 This year’s prolonged monsoon, which lasted almost until the start of the one-month long Dashain and Tihar holiday, has delayed the construction. 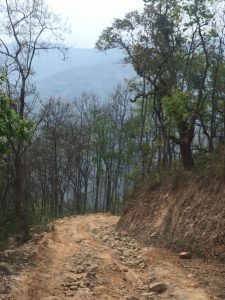 During the monsoon the roads to the village are still not possible to use, so there has been no access of material needed to be transported by truck in almost three months. Finally during the holiday it has dried up and the work is soon to be restarted. Great news! 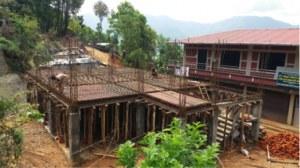 Thokarpa VDC has been able to obtain money enough for the health facility to get a full upper floor! The top floor framework is ready and has been able to build in spite of the rain. 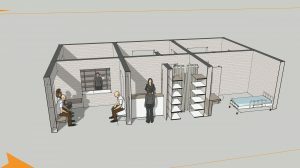 The second floor will contain lodging for medical staff, a conference room among others, and in total the health facility will include 14 rooms. The monsoon has arrived and it’s raining heavily. The work has to be put on slower pace. 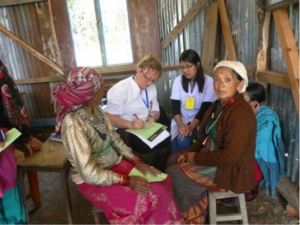 Today’s session was a joined session with the three different groups working with basic health in the village. These include health workers, social workers and ayurvedic workers. The different experiences and skills these groups represent are most fruitful in this collaboration. Today’s session focused on respiratory diseases and prevention, as well as on First Aid. We talked about the worldwide difficulties in working with prevention, what to be included in our next education program among other topics. In Bhag Bhairab, the village center, me and Aastha today had an almost four hour long session with the village women (mahila). Compared to last time’s maybe 15 participants, today 40 women came to join. 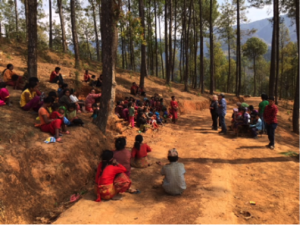 This session turned out to be very active and lively among the participants of all ages, and with most fruitful discussions concerning how to deal with different women’s issues in this village. 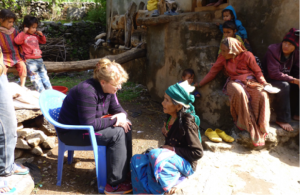 This Spring’s education program downhill in Pahari Community was performed by prof Marieann and Dr Anna. The subjects were respiratory diseases and –prevention together with common hygiene and basic knowledge about health and diseases. Today almost 100 persons attended the education session, which is about twice as many as last time. As required the topic for today’s session, with teachers representing Thokarpa’s five schools, was First Aid. This session included basic knowledge in lifesaving skills, wound care, fracture management and live demonstrations among others. 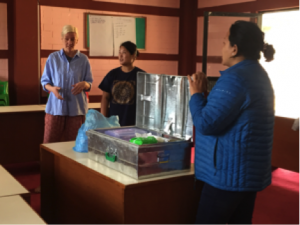 We also presented the First Aid Box we’ve as agreed brought to be placed in Thokarpa’s biggest school. Such a First Aid kit hasn’t been available in either of the schools before. 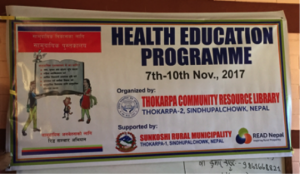 We’re in Thokarpa for a three day health education program. 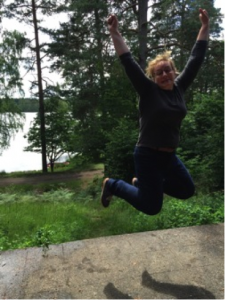 In this Spring’s team we find the Swedish participants Dr Anna Gunnarsson, prof Marieann Högman, mr Brian Högman and myself. 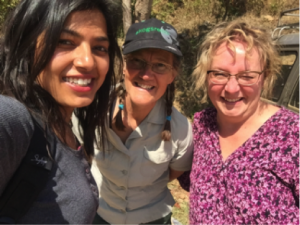 As before our team as well consists of our interpreters, Kabita Lama, Aastha Palilchey Rai and Yunesh Subedi. 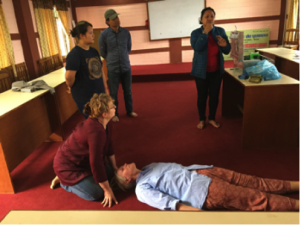 This Spring’s health education program will focus on sessions with the Thokarpa School teachers, health-, social- and ayurvedic workers, a women session and a day in Pahari Community. During today’s visit we’ve seen Internet been used in the village. The Internet tower making this possible is located on a hill in the forest ten minutes walk from the village center Bhag Bhairab. 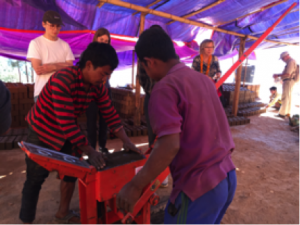 Two of the brick machines are located in the poorest communities of Thokarpa, Pahari and Dalit. 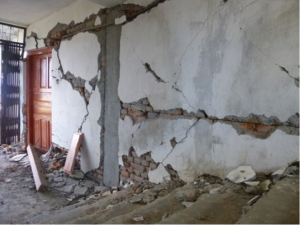 Today’s pictures are from two of the private house earthquake reconstruction sites in Dalit Community. 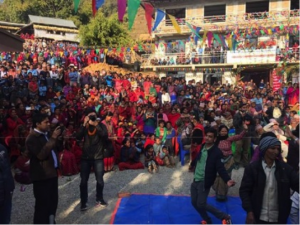 Within the overall work of improving the health situation in Thokarpa village, the VDC has been approved to run a temporary governmental information health service. This service will be held in the village for 6 months, planned to overlap the start of the major health facility under construction. If possible, this smaller service will hereafter be transferred to Pahari community. This temporary service is since a few weeks run by two health workers who provide about 25 patients a day with health related information as well as basic medicines. 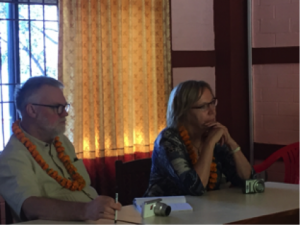 Today I’ve had the opportunity to introduce my friends Olivia Biermann, representing FHN and Leif Bjellin, SNS, to our project in Thokarpa. Besides been shown the current status of the health facility, we’ve had fruitful discussions with Netra Karki as well as with Shankar KC. We’ve been visiting Deevya’s parents and have been updated about the ongoing brick production as well as building of private houses in the village. 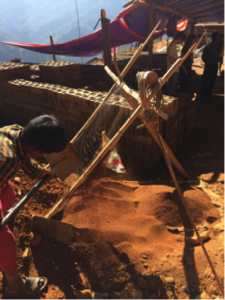 150 private Thokarpa households are in line for rebuilding their earthquake-destroyed homes with earth bricks. 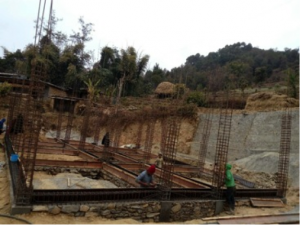 Four brick machines are now rolling continuously in the village and the construction of private houses is in process. 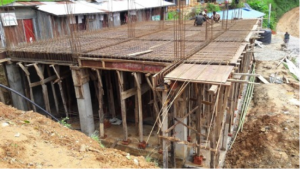 Foundation and pillars for the health centre are being done. 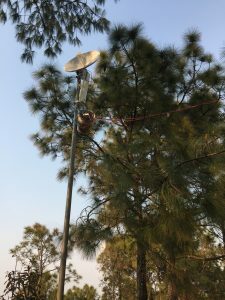 A few days ago, Internet was finally connected to Bagh Bhairab, Thokarpa city centre. A great moment and an important step for the future. 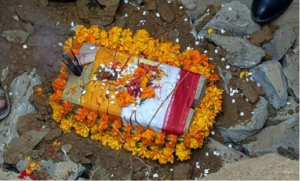 In order to worship the land and the bricks to be used for the health centre before the main big excavation work begun, an inauguration puja was held at that particular piece of land today. A puja refers to a specific ceremony within the Hindu culture. 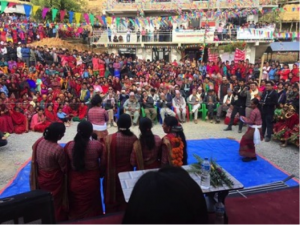 This ceremony was held in the presence of all the local political leaders, the VDC board, a delegation representing Kathmandu Medical College and Maitreya Foundation among many others. After finishing the first part of the puja, the dozers started their work. 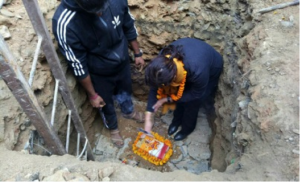 Parts of the puja were hereafter held by putting a worshipped brick into the foundation of one of the keystones. Today Foundation Human Nature (FHN) and Kathmandu Medical College (KMC) have signed an agreement concerning the conditions for FHN’s sponsorship of Deevya Karki’s 4 year Nurse Education at KMC Nursing School. With Netra Karki becoming the Thokarpa VDC chairman, he’s now got the authorization to distribute the governmental funds and other local finances. Thanks to this, Thokarpa VDC has decided to contribute with a larger sum then expected to the health centre. This means that SNS and the VDC will pay about an equivalent sum of money to this centre. 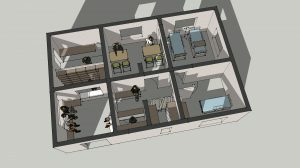 With this opportunity, the final design has been expanded to include ramps and bigger working areas among other things, including a better plan for designing a possible second floor later on. 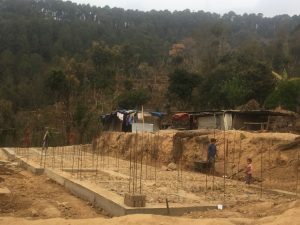 So far 110 Thokarpa families have signed up for private home post earthquake reconstruction with the earth brick technique. Four machines are at the moment in production in Thokarpa, the first one donated from Sweden-Nepal Society. 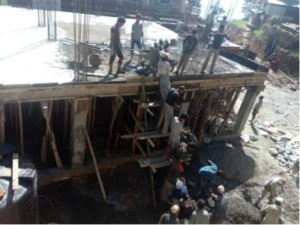 Two of the machines are placed in Pahari Community with intense work going on. 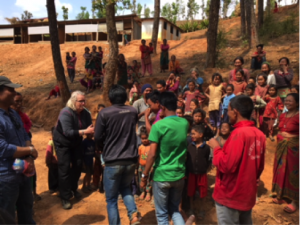 Today I’ve been back in Thokarpa, happily introducing more Swedish guests. The guests today representing Sweden-Nepal Society, Vilma Minkkinen Brandt, and Föreningen Nepals Vänner, Torsten Åhs. From Linköping University the two medical students Ida Kallur and Petter Thorell. We’ve had a tour around the earth brick made community library building and have been discussing the health centre excavation start within a few days. 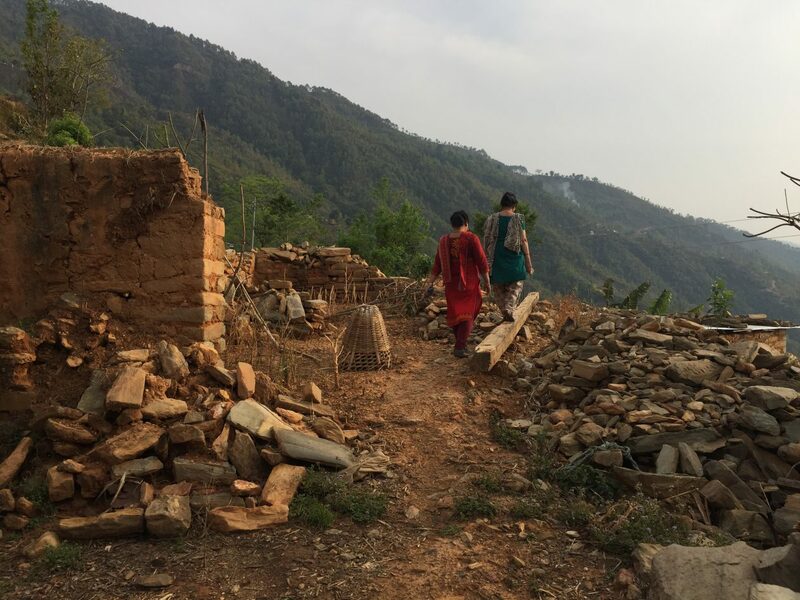 We’ve attended a meeting with Netra Karki, other VDC board members and social workers and we’ve had the opportunity to go and visit Pahari Community where two of the earth brick machines at the moment are placed. 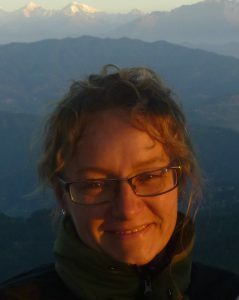 Today Netra Karki, me, Sandra Isaksson and Michael von Schickfus representing FHN, met Deevya Karki in Kathmandu. 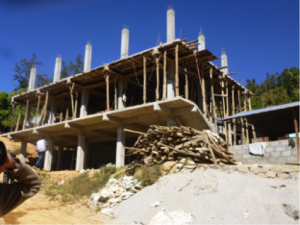 Since Caritas, another INGO working in the village, has promised to provide for the KMC staff quarters in an adjacent building, the funds from SNS could now fully be used for the actual health centre. After being back in Kathmandu from the village this evening, Netra and I went for a meeting with Björn Söderberg at Build Up Nepal to discuss new design and attached budget for the health centre. 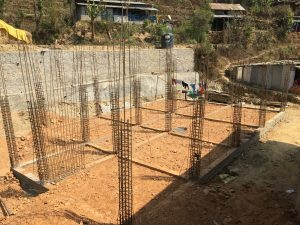 Since Netra Karki has been able to distribute VDC finances towards this health centre, the conditions now looks a bit different with more and better possibilities for the future then first expected. The ground excavation start is now planned for November 15th. 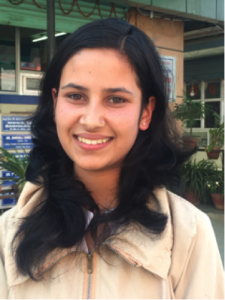 The first Thokarpa girl chosen for this program is Deevya Karki, who has a couple of months ago, started her 4 year Basic Science Nursing Education at Kathmandu Medical College in Kathmandu. Deevya’s family attended today’s signing program and invited us after finished session to their home for a cup of tea. 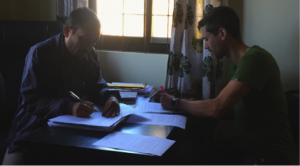 Today Thokparpa VDC and Foundation Human Nature (FHN) has signed an agreement, saying that the two parties will establish a sustainable collaboration with the aim to improve the public health care and education in the Thokarpa region. FHN will give regular financial support to selected students going for health educational programs at a Nepali medical university. Thokarpa VDC shall select these students from a socially deprived background or from a minority group. 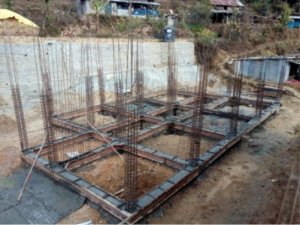 It is mandatory for the student to commit work with the primary health care centre in Thokarpa for at least two years after finishing education. 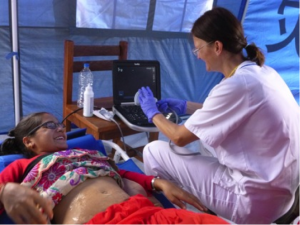 Women’s health is a subject widely talked about and of many Nepali’s concern. During our days in the village this time we’ve been involved in several discussions concerning family planning, women health habits, uterus prolaps, sanitary pads among other things. After our discussions with the local health workers, we’ve started to learn more about the special circumstances and needs for women in this specific region. Today we had an afternoon discussion with local women of different age, talking about reproduction, pregnancies, uterus prolapses and other post partum problems, diseases like breast cancer, infections, sexually transmitted diseases, menstruation and bleeding disorders among other things. Being in the middle of the rice harvest, not many women could attend, but by the ones joining there was an obvious wish for us to have this kind of conversations and information regularly. We’ve started planning for that and will include a similar program coming Spring. The youth health program was separated in groups of boys and girls, and was accordingly held for approximately 30 boys in class 8-12. With the great impact school teachers have on a village’s common knowledge about health and diseases, as well as in many other subjects, we’d arranged a meeting to discuss if there might be any interest in further training of the Thokarpa schoolteachers within health science. To expand our knowledge we’ve read and discussed the health science schoolbooks available for the village’s school children. Together we’ve planned for a first session coming Spring including teachers from five nearby schools. According to requests, this health education program has included sessions for in total about 50 girls from class 8 to 12 concerning youth health. 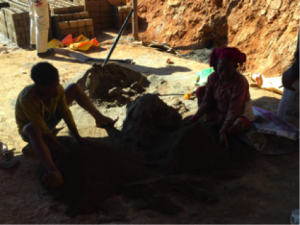 These sessions were held in the community library (made by earth bricks) instead of in the school building. Thanks to active and outspoken girls and to excellent work from our interpreters, I think we all had a fruitful day with new understandings, knowledge and a lot of laughs. 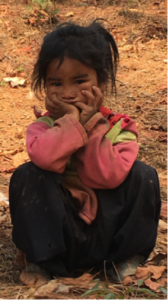 Approximately one third of the households in Thokarpa belong to the Pahari Community, which is known to live under very poor and difficult conditions. Many problems concerning health and diseases are widely spread in this community, which faces great challenges to cope with it. Netra Karki has defined one of his main goals within his period as VDC Chairman to improve the health conditions in this part of Thokarpa. According to that we’ve been specifically asked to make special efforts now, as well as onwards, in this part of the village. Important work was therefore to be initiated there today. To discuss and learn more about the local health conditions and challenges, we’ve today had a first meeting with the health care providers in the village. These include health workers, social workers and ayurvedic workers. Based on these discussions we’ll start planning for how an on-going long term further training for this target group would possibly look like, to define specific concerns and where to start. 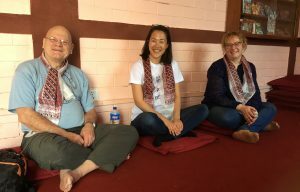 Together with my Swedish colleagues Dr Michael von Schickfus (representing Foundation Human Nature, FHN) and Dr Sandra Isaksson, I’ve been in Thokarpa for a four day Health Education Program. 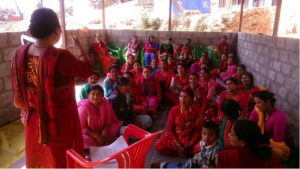 Details are to be read separately, but in general this Autumn’s program has included discussions with local health providers and school teachers, basic health education in Pahari Community, youth health sessions for class 8-12 and a women program. This time we’ve worked with help from three interpreters, Kabita Lama, Aastha Palilchey Rai and Yunesh Subedi. Thanks to them, we’ve this time taken a big step forward in our understanding of what difficulties and challenges concerning health and diseases this specific area is facing. It has been a great opportunity for bilateral learning between the villagers and us, and for planning coming health education programs and further training. 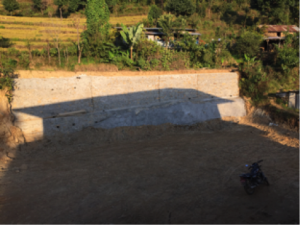 To be able to prevent landslides during monsoon time close to the health centre, a great amount of work has been done to make a supporting wall behind it. It has been a big challenge but is now ready and approved, a water drainage system included. 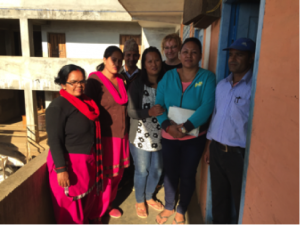 Within this collaboration project, Foundation Human Nature (FHN) has committed to finance nursing school for one Thokarpa girl. The process of choosing this girl is now finalized, and Deevya Karki from Thokarpa is just about to enter her 4-year BSC (Basic Science) Nursing program at Kathmandu Medical College (KMC). 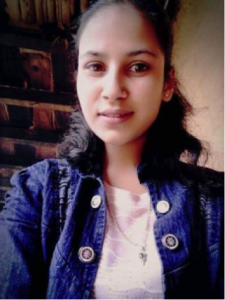 Deevya Karki (not related to Netra Karki) managed to get really high scores at the BSC Nursing Entrance Exam, total top three within Kathmandu University this year, and has been offered a seat at KMC Nursing Program. 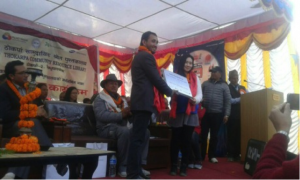 By accepting this, Deevya and her parents have committed to that she, after finishing her studies, will stay and work as a nurse at Thokarpa Health Centre for three years. 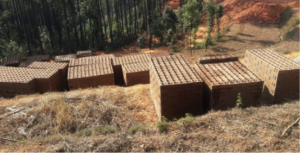 After the final governmental approval of using the earth brick technique for building private houses as well, a great demand of these bricks has hit Thokarpa. 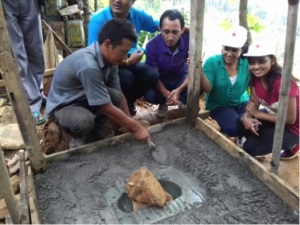 The villagers are really enthusiastic about using earth bricks for rebuilding their village. 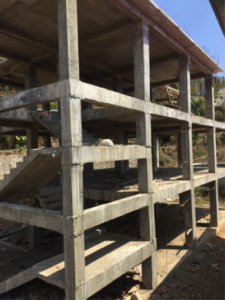 The final approval means that building private houses with this technique will be accepted for getting the governmental (small but important) funds distributed to earthquake victims by the Nepal Reconstruction Authority. 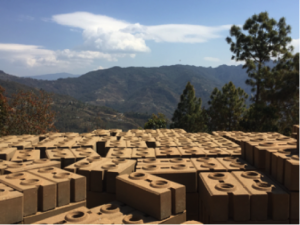 Another INGO working in the area has decided to support Thokarpa with another three earth brick machines, which are on their way to the village arriving this coming week. 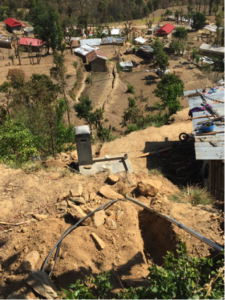 With the possibility to make bricks for about 40 private houses a year and machine, this area’s post earthquake reconstruction will now finally get started for real. It will as well give a great rise in job opportunities in the village. 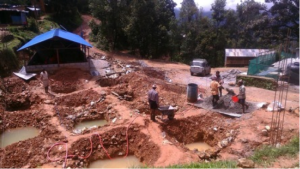 Finally this year’s heavy monsoon rain is slowly drying up enough to make the road to Thokarpa accessible, as well as making it possible to start working on the foundation. 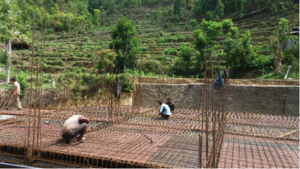 Build up Nepal’s engineer has been visiting the village a few days ago, initiating the work by marking the foundation. 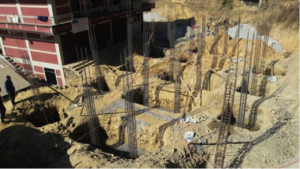 The foundation digging is just about to start as well as building a retaining wall behind the health post, preventing sliding and movements from the slope at the back of it. 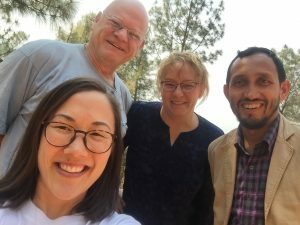 After several months of discussions and sharing ideas, the Sweden-Nepal Society is proud to welcome a new collaboration partner into this project. 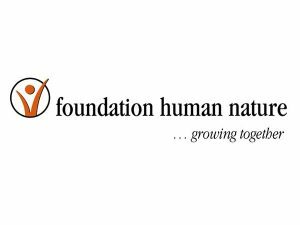 The name of this Germany-UK based INGO is Foundation Human Nature (FHN) and is an organization that in every aspect shares our values. For more then 15 years FHN has been running health care centres, similar to ours, in Ghana as well as in Ecuador and their thorough experience will be most appreciated and useful in Thokarpa. 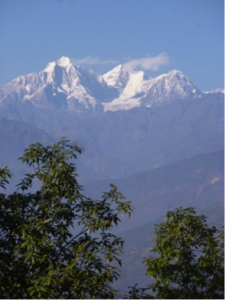 The role of FHN in Thokarpa will mainly be based on health education. More about this experienced and ambitious organization is to be read at the FHN website www.f-h-n.org. We’ve today been informed that the Thokarpa health service has been granted an annual governmental contribution onwards. Even though it’s a small amount of money related to what it’s supposed to cover, this is a very good next step in this process. This means that the government expects public health care to be offered in Thokarpa, and that the transition to governmental service within a few years hopefully will run more smoothly. 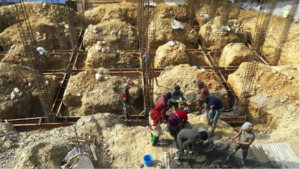 Several different and time-consuming bureaucratic processes concerning earthquake affected private house building permits have finally been set. 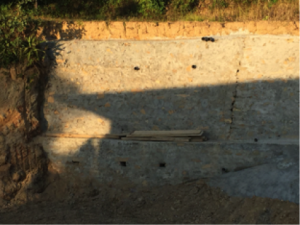 Private family houses have now started being build with the earth brick technique in Thokarpa village. 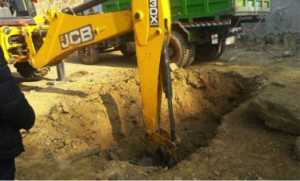 Awaiting the monsoon to clear up a little bit to be able to start excavating the health centre foundation. 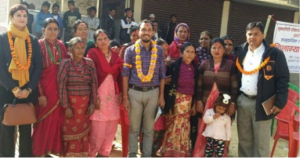 Within the local elections, Netra Karki has a few days ago been chosen as the Thokarpa Village Development Committee Chairman, which is close to what we would call a mayor. From the Swedish side we are truly happy about this. Netra Karki is just the right person to go for this challenge, and we are confident that he will fulfil his task in the best possible way. 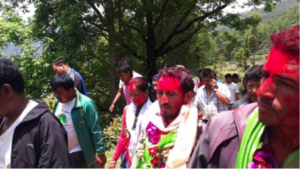 Netra Karki has announced that his first priority during his five-year commitment will be to enter a new stage in the village’s health status. 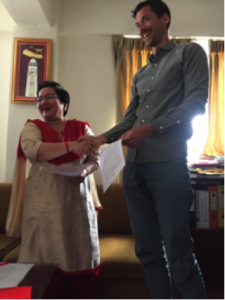 From the Swedish side we are proud and happy about Netra Karki’s new position and wish him all the best for the coming five years new commitment. 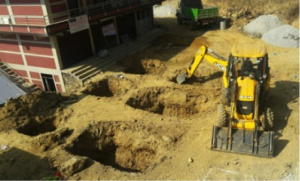 Today the mechanical excavation has started, preparing the land for the Thokarpa health facility. The new work was traditionally initiated by tikka worship. Since a few days we have now got the last approval from the governmental side we’ve been waiting for, to be able to start the actual construction. 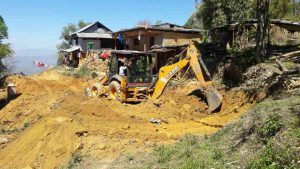 The piece of land in Thokarpa centre is being excavated and prepared, and will be ready in a week or two to set up the foundation. The final approval will then be made by the Chautara DPHO (District Public Health Office) when the building is finished, furnished and equipped. 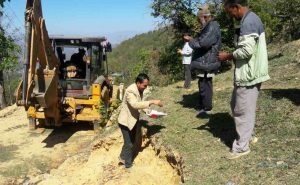 There is a road-widening project going on along the road from Sukute uphill to Thokarpa, and the government has given its approval for it to be black topped within two years. This will make a big difference for the population of this area, since it will ensure access to the road during the monsoon. 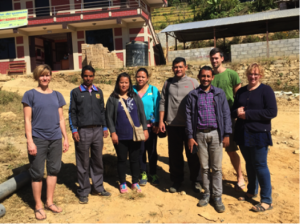 Today I’ve been in Thokarpa together with Netra Karki and my Swedish guests Maria Lindeberg and Elisabet Carlgren. 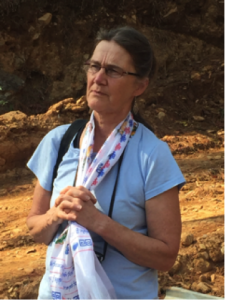 Marie Schön, coordinating Swedish NGO’s working in Nepal, had as well the opportunity to join us, for which we were really grateful. 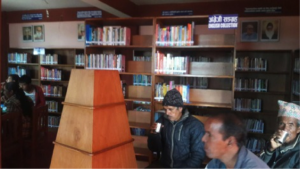 This non-formal meeting was held in the e-library with representatives participating from all involved Kathmandu based organizations as well as from all local stakeholders. 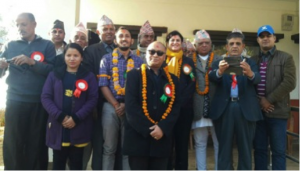 Participating were representatives from Maitrya Foundation, Sweden Nepal Society and Kathmandu Medical College as well as from a Nepali NGO called Survivors Nepal and from the Ministry of Health. 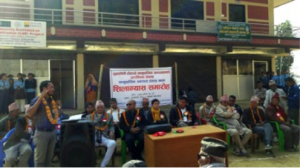 The VDC-secretary representing local government attended this meeting, as did political leaders from this area’s three major parties, representatives from the local cooperative, from school and the chairperson of the local women’s committee. All local representatives expressed their great optimism for this coming health facility. Specific enthusiasm was shared from the school spokesperson, since no health service has so far been available for the children. All local representatives gave their full support and strong commitment to this project in every angle and in every step. Sabina Bhattarai and Sunil Joshi confirmed the up to date info on which facilities will initially be run at this health post. Sabina Bhattarai as well informed about the free bed service at KMC in Kathmandu, and that these will be available for patients from Thokarpa who will not be able to pay for inward service. Some fears about sustainability and manpower providing were expressed, but overall everyone participating at the meeting were very optimistic about this collaboration. Yesterday Netra Karki and myself went to Thokarpa together with vice principal Dr Sabina Bhattarai and the Head of Department of Community Medicine Prof Sunil Joshi, both representing Kathmandu Medical College (KMC). This KMC visit to Thokarpa was well prepared as well as fruitful. After an initial stakeholder meeting we had a sightseeing around the newly inaugurated community building, the e-library made out of earth bricks, which gave a stunning impression to us all. We were as well shown the new permanent area for brick production, close to Thokarpa centre and next to a big area with good quality soil to be used as brick material. There has been an incredible change within the 1.5 years I’ve been involved in this village. So much work has been done. 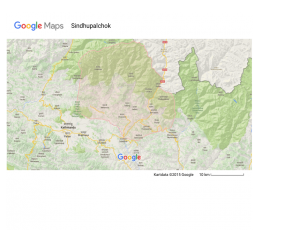 It for sure stimulates further work to be performed, for Thokarpa to in the future serve as a raw model for other Sindhupalchowk- as well as Nepali villages. 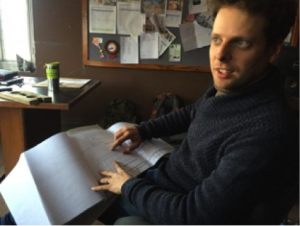 I’m in Nepal and have today met Björn Söderberg and Netra Karki at Build Up Nepal’s office in Jhamsikel, Kathmandu, to discuss the final drawings and further project plans. 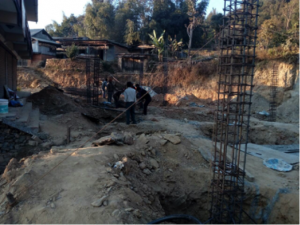 We’re awaiting the final expected approval from the Sindhupalchowk DPHO (District Public Health Office) coming week, which, after further approval at the Health Ministry and still another Kathmandu based department, is in progress. We regard a considerable reason for this delay in permission progress to be that we so far have, and will continue to run this project without bribes and/ or influential contacts. This takes time and with that strategy we don’t end up first in line. This in a time of hundreds- maybe thousands of similar post earthquake building projects. Björn Söderberg still estimates the health post building to get started before the monsoon. 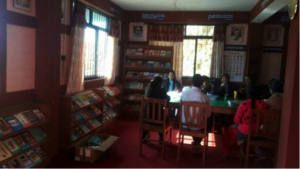 Two weeks ago the new big three floor gathering hall in Thokarpa center, the E-library, was successfully inaugurated. 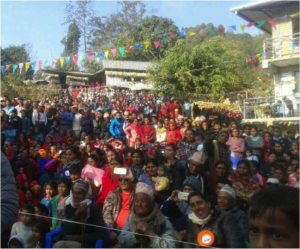 As told by Netra Karki’s reports and pictures, pretty much everyone from the village was there enjoying the inauguration. Dancing- and singing performances, banners, flags, speaches, diplomas, more dancing and singing and more speaches filled this festive day. The e-library building itself is the first building in this area to be build from the ground and completed, constructed by the earth bricks the village people themselves have made locally out of the SNS donated earth brick machine. Another INGO has contributed with other funding in this e-library project, while all practical work including preparation of land, brick making, building, painting, buying furniture, books, computers etc all have been done by the villagers. 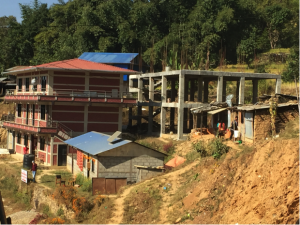 The importance of this new building for the severely earthquake affected Thokarpa village and it’s surroundings is extensive and of great meaning for the days to come. This is the beginning of a new future, a future the villagers are building themselves. 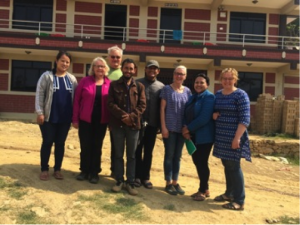 Recently representatives from an international IT expert team (Netherlands and the US) have been visiting Thokarpa working on Internet connection in the village. 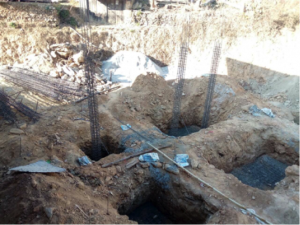 Netra Karki lets us know that the progress has been very positive and that Internet connection to Thokarpa might be possible already within a few months. Thokarpa’s VDC-building, the new town hall sponsored by a Japanese INGO, is now ready build and inaugurated. 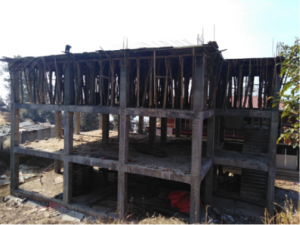 The completion of this was needed for being able to initiate the health post building, since the post earthquake temporary town hall in corrugated sheet has been located on the piece of land planned for the health post. Since the new town hall has been completed, the piece of land set for the health post is now ready to start preparing. Netra Karki sends everyone his warm wishes for a Merry Christmas and a Happy New Year with greetings from Thokarpa village! 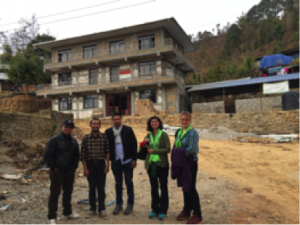 Together with Netra Karki and Kerstin Björlin, I visited Thokarpa some days ago. To be able to understand something properly, you need to see it and touch it. Now I’ve touched and seen hundreds of earth bricks, myself been able to see what a great activity is going on in the village and how many people are busy working with the e-library inspite of being the last week of high season for rice harvesting. 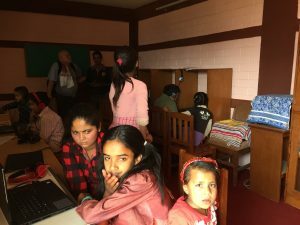 At least 10-12 men working with the e-library that day, including engineers, technicians, construction workers, instructors, head of local management mr Shangkar, brick manager mr Ram Chandra and Build Up Nepal’s engineers mr Indra and mr Madu. Three new houses have been built in the village center since I was last here in April, and shortly building of the fourth, the health post, is about to start. There’s a new cafe and several new small businesses are planned within as well as outside the e-library. The e-library, which will be located next door to the health post, will contain a small ordinary book library, computer hall, TV-room, a women section, room for studies and an agriculture section. There will as well be a children’s section, a meeting hall and four small shops, whos rent onwards will finance the maintenance of the e-library. 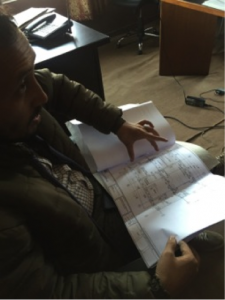 These businesses will consist of a tailor, a book salesman, a shop for baby equipment and a small teahouse. 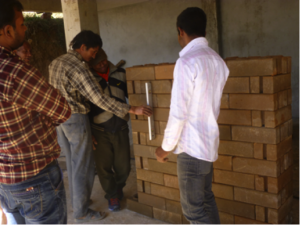 The 7000 bricks needed for the e-library are finished and the ones made from now on are meant for the health post. Next week the construction workers will start preparing the piece of land planned for the health post, to be finished in time for when the last permission from the Health Ministry is approved upon. I’m in Kathmandu and have had several meetings with Netra Karki. 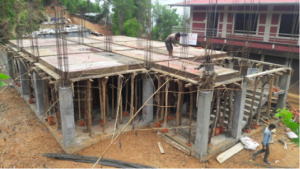 Thokarpa is full of energy and the bricks made for the e-library are soon to be finished. People from several surrounding villages have lately come to visit to take a look at and to be told about the brick machine, to look at the ongoing constructions, to discuss economy and to talk about the future. 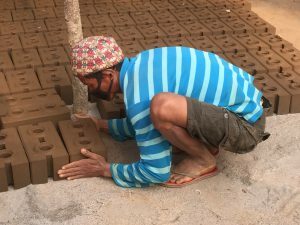 According to Netra Karki the total cost for any house build with this technique is about 1/3 compared to building with ordinary bricks even without reinforcing bars. Besides this the house owners can be tought how to put up and fix the walls themselves, which as well reduces the costs. Furthermore most of the construction material is collected from nearby areas. There is a huge interest in the village and there are ongoing plans concerning how to be able to buy two or even three more earth brick machines. 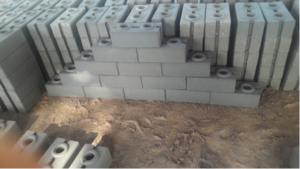 A couple of entrepreneurs have shown their interest in maybe starting a business and several people are interested in working with the actual brick production. The progress of the e-library building has so far been beyond expectations. 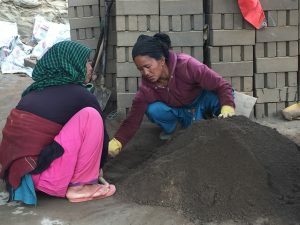 The Tokharpa residents are engaged, optimistic and are planning for the future, quite different to the harsh situation coping with the earthquake devastation and tragedies a year ago. Seven men have been introduced to the actual earth brick production. 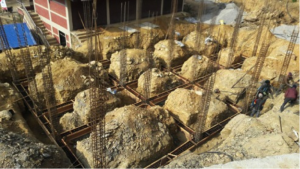 ”Soil”, approx 60% of the building material, is taken from a location close to the spot being chosen as production area. 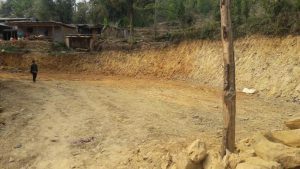 10% cement needs to be bought and brought from Kathmandu and 30% sand is being transported from Sukute, a village in the nearby valley and where good quality sand is produced. 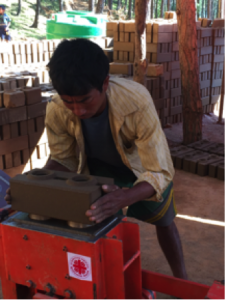 After two weeks only the brick producers were making approximately 300 earth bricks per day, which is incredably well done. 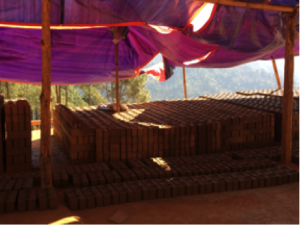 For the e-library, which will be the first Thokarpa building to be made with this technique, it’ll need approx 7000 bricks. 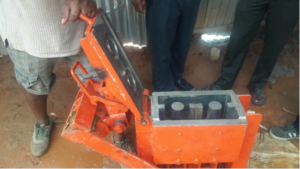 Briefly calculated, this machine will be able to produce bricks for about 40 new private houses in the village per year. The production for private houses will start immidiately after the health post is finished. 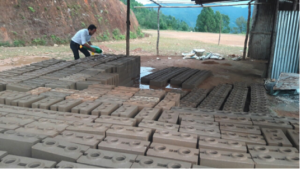 Preparations have the last couple of months continously been going on in Thokarpa to be ready to recieve the earth brick machine donated by SNS. Soil is being collected, sand is brought from Sukute and a defined piece of land is set up for brick production in the village center. 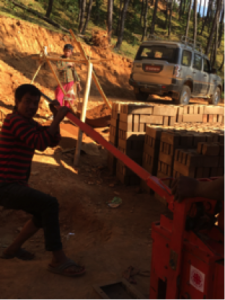 The brand new brick machine was brought to Thokarpa from Thailand in mid September and is now running in the village. How will this process be monitored in the village? My next trip to Nepal will be coming March and April, and I will myself continuously, about every 6 month, be able to go to Thokarpa to follow the proceedings in the village. Besides that Netra Karki and Björn Söderberg among others will continuously update SNS, KMC, MF and myself. When will the actual building be able to start? Is more permission required? At the moment Netra Karki is in charge of the process with getting the requiered permits from the following offices and departments; Sindhupalchowk DPHO (District Public Health Office), Sindhupalchowk DDC (District Development Committee), Health Service Department (ministry level) and Building Department. This will approximately take another couple of months to process. 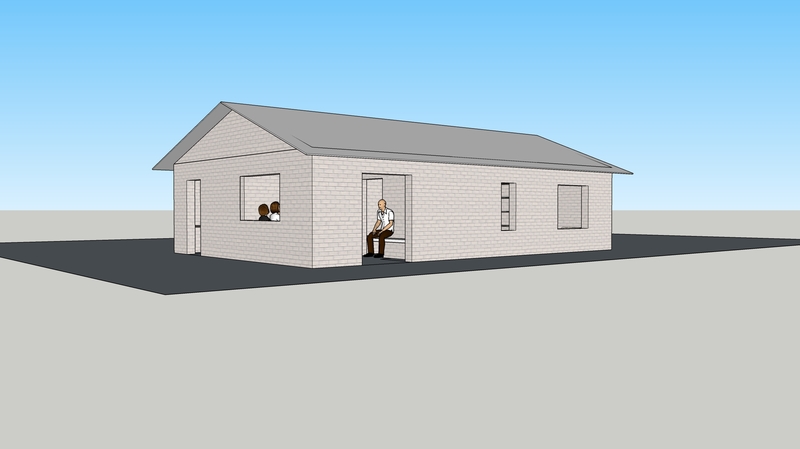 An actual date for the construction to start is yet not set, but we hope to be able to get started in mid January, initially possibly with the staff building. 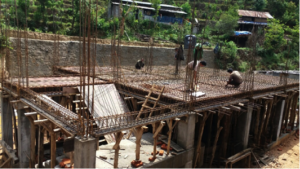 Build Up Nepal counts on getting the houses ready to use within nine months from day one of building. Different kinds of health educational programs are planned in Thokarpa, including programs with my participation, for the future. 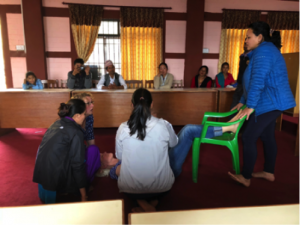 This Spring I went together with two experienced Nepali health educators to Thokarpa for a three day ”Health Education Program” in the school and for women groups. My Nepali colleagues were, during this programe, responsible for education concerning the woman’s body, pregnancies, hygien, sexually transmitted diseases, the women panorama of diseases including gynaecological cancer and uterus prolaps, giving birth, neonatal care and how to prevent unwanted pregnancies. I was responsible for a school program in the higher classes teaching skills in basic emergencies, ABC, if something’s got stuck in your throat, how to handle fractures, discussing basic hygiene and infections among other subjects. 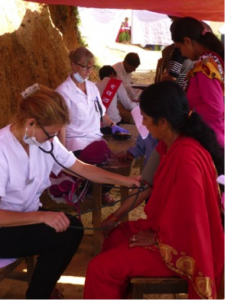 In collaboration with KMC a group of Swedish doctors and nurses, mainly from Linköping, performed a health camp in Thokarpa, Kalika and Nawalpur in September 2015. 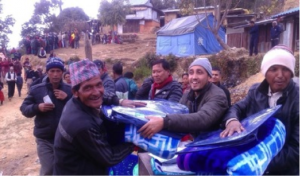 This was the first time any health care had been avaliable in these villages after the immediate earthquake relieve. During 4 days this group met and treated approximately 2200 patients. Thanks to medical records set up during this camp, which have since been registered and collected, we’ve got a good overwiev concerning this areas public health problems. 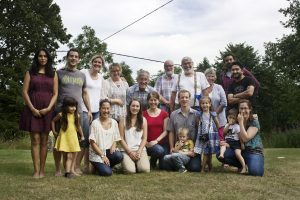 What is a health camp? 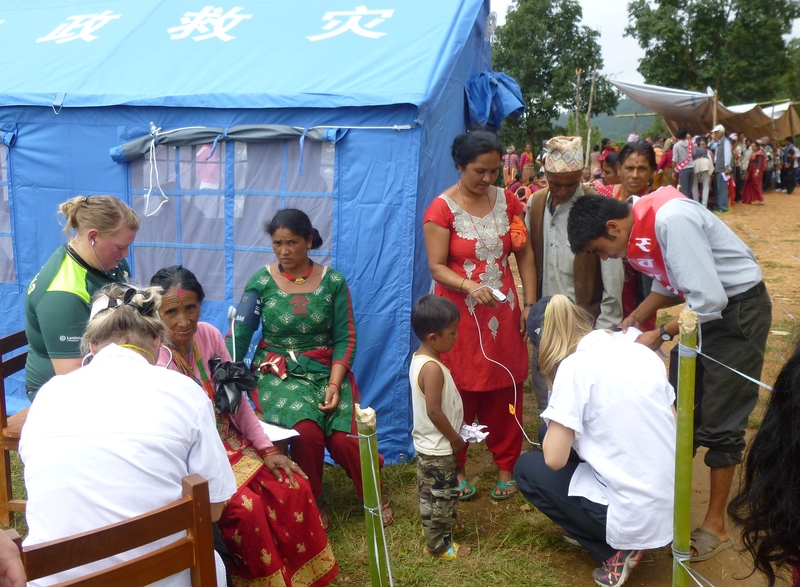 Health camps are mobile clinics staffed with volunteering doctors and nurses, commonly seen in Nepal. These health camps are usually set up for one or a few days in remote areas and for the purpose of offering free check ups for patients who would otherwise have no access to medical care out of practical or economical reasons. Consultations, treatment and medicines at these camps are out of cost for the patients, and the amount of patients per day easily reaches several hundred. 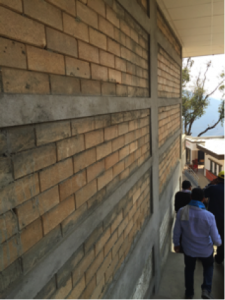 Access to water and electricity are crucial for running a health facility. 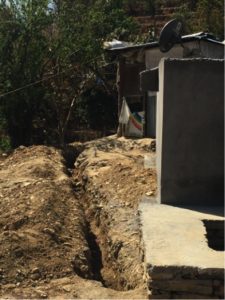 This health post will have access to water as well as electricity all year around. We are installing a solar panel to be used as much as possible and there will as well be a generator as an extra back up. What will the health post look like? Attached are the latest, out of many, drawings. Build Up Nepal has chosen to make it symetric, as in the picture, to make it even more resistent to new earthquakes. Where will this health post be located? 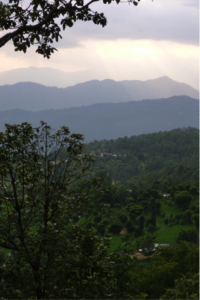 The piece of land to be used, owned by the Thokarpa village itself, is located right in the middle of Thokarpa center. There is access by road all the way to the health post and with a bus stop just next to it. Despite winter weather and monsoon rain, this road is generally able to use for busses, cars and two wheelers all year around. If possible to get finances to cover it, there is an ambition in being able to pay for nurse school for 1-2 Thokarpa girls, in return signing up for working at the Thokarpa health post for a few years after finishing their studies. 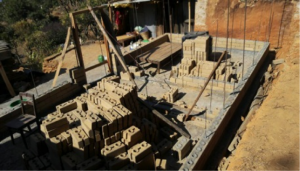 Since the earth brick machine, as well as the knowledge in how to use it, will be left in the village after the health post is finished, local entrepreneurship is provided and manpower needed to be able to go on with this technique in the village. 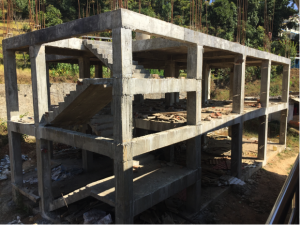 Our ambition is that the brick machine and it’s use in the health post will inspire to be used onwards in rebuilding private earthquake affected houses in Thokarpa and its surroundings. 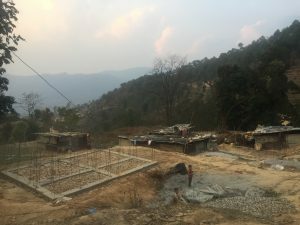 The area surronding Thokarpa has shown a great interest in Build Up Nepal’s building technique and earth brick production. 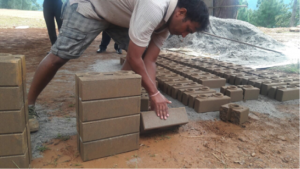 Several families are already lining to use these bricks and building technique for rebuilding and reconstruction of their private homes after the health post is finished. 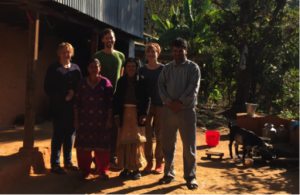 The managing director of Build Up Nepal, Björn Söderberg, is a member of SNS and will through this project personally work without salery. SNS will, after the health post is finished, donate the earth brick machine to the village, in purpose of supporting rebuilding and reconstruction of other parts of the village and it’s surroundings. Björn Söderberg and his coworkers will be responsible for training local manpower in this press- and building technique, and an area in the village center is chosen to be the base for the earth brick production. Internet access from Thokarpa onwards will of course, as well as it will in other aspects, have a great impact on the quality of the health care to be avaliable within this health post. 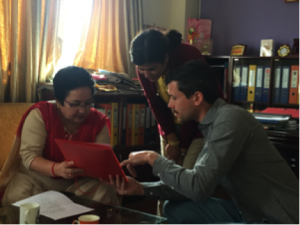 As an example the staff will be able to go for information online, as being able to send pictures of for instance skin- and/ or other diseases to be assessed by consultants working at KMC in Kathmandu. 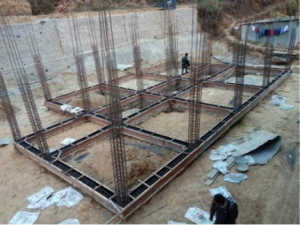 The e-library is the Thokarpa building under construcion, which will be the first building in the village to use the Build Up Nepal earth brick building technique. 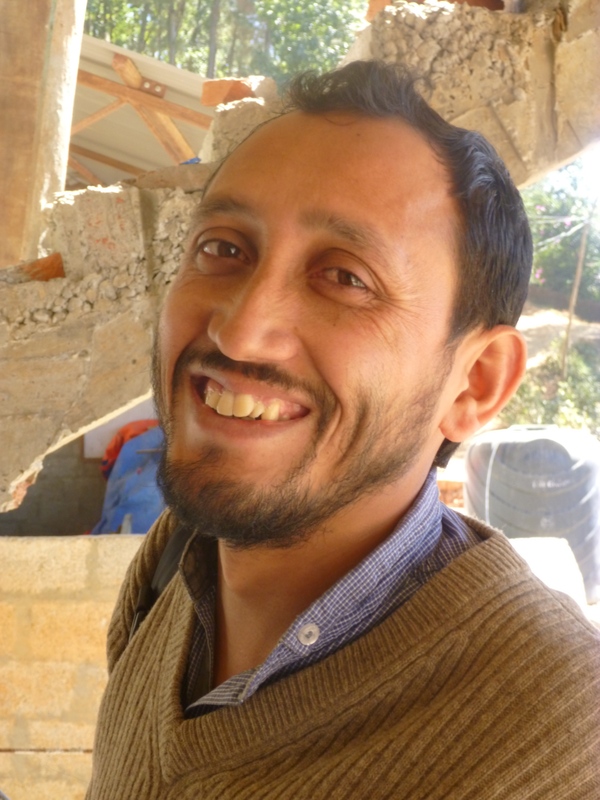 Netra Karki, born and raised in the village, is Thokarpa’s head in charge of this project. 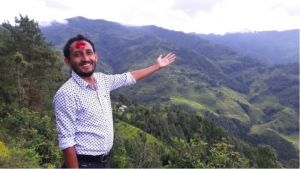 The humble and realistic as well as optimistic Netra Karki has a unique ambition to improve the living conditions in his home area. 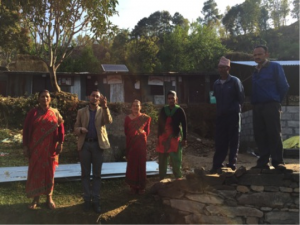 Besides running this health post project, Netra Karki has been working on introducing solar panels for all Thokarpa households as well as he’s been engaged in building toilets and supporting the village with blankets among other necessities during the last harsh winter. 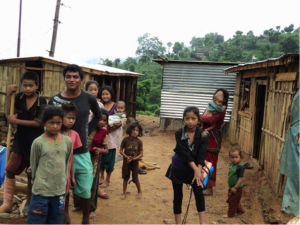 In Thokarpa village he is, together with the VDC, working on connecting the village to Internet and is in charge of building an e-library just next to the health post. 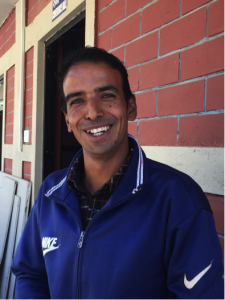 On a daily basis Netra Karki lives in Kathmandu, where he runs and produces his own TV-show, concerning alternative resources of energy. The show ”Mission Urja” is run weekly on News24, which is the main nationwide news channel in Nepal. I’ve been engaged in Nepal for 20 years. 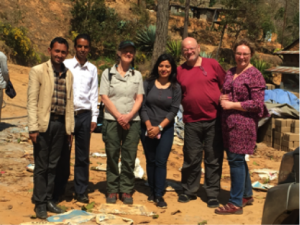 The last 6 years I’ve on a regular basis spent about 3 months a year in Nepal, working with SIDA- and other kinds of projects within the health sector. 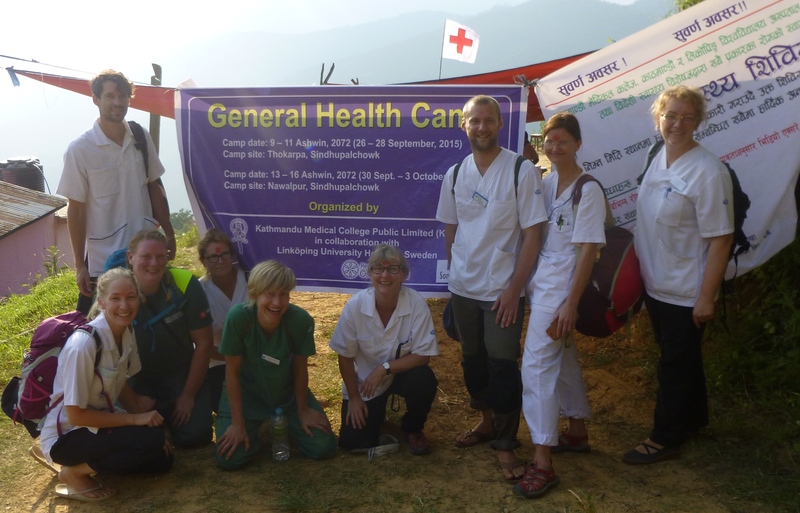 During last year, 2015, I stayed in Nepal for almost 5 months working partly with the Thokarpa health post project, partly with several so called health camps in remote areas, as well as supporting previous projects with extended need of help after the earthquakes. On a daily basis I work as a consultant at the Linköping University Hospital ER, specialized within emergency medicine and orthopaedics. In Linköping I, besides working with the the Thokarpa project and giving lectures, similarly work with establishing another Nepali exchange program on behalf of the International Medical Program within Linköping University. 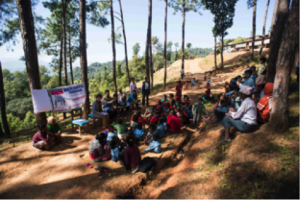 I support a village in Kokhana, focused on long term rehabilitation for leprosy patients as well as I support a school for orphan children in the tempel area of Pashupathinath, Kathmandu. 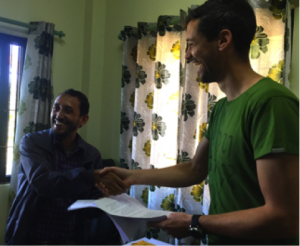 For the future there are plans on initiating a health project in Bajhang in remote western Nepal. 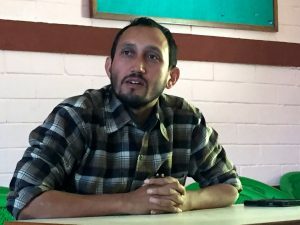 Katak Malla is a jurist with a doctoral degree in international law at Stockholm University, the Department of Law, Sweden, mainly focusing on human rights, environmental law and corporate social responsibility. 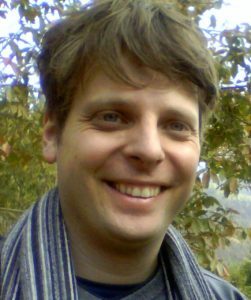 He has a global cultural competence and is highly experienced in international human rights, as well as issues of international environment and political science. Katak Malla was born in Bajhang in Far West Nepal and has activelly been engaged in the development of democracy in Nepal. 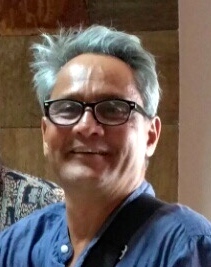 Katak Malla is chairman of the Sweden Nepal Society. 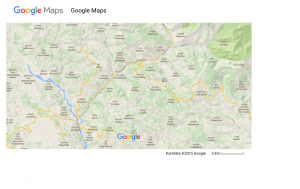 Without Katak Malla’s participation within this project, it had never been feasible. Katak Malla’s unique skills concerning Nepali law, negotiation technique, specific challenges in remote areas, how to deal with corruption and how to, with humble and great endurance make progress within Nepali negotiation on a high official level has been crucial. 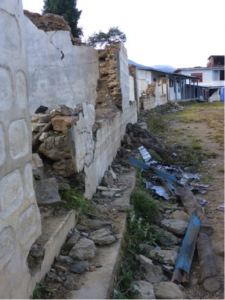 Maitreya Foundation (MF) is a small Nepali registered non-profit NGO, who was initiated after the earthquakes, aiming to support earthquake victims. MF is a religiously and politically non-committed organization and registered under the Nepali government. 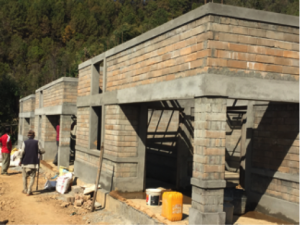 Beside the Thokarpa project MF has initiated building 1200 immediate quake relieve houses in Ghorka, Sindhupalchowk and Dolakha. 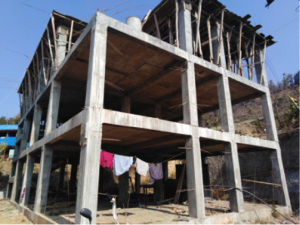 This NGO as well continously work with building and running a boarding school for Sindhupalchowk children, being left without any home after the earthquakes. 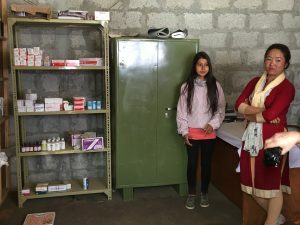 Maitreya Foundation (MF) has in this project agreed upon catering the health post with medical drugs and has, as described above, signed up for a not less then 10-year collaboration. MF will support the VDC in practical matters and the aim is that Thokarpa ahead, in collaboration with KMC and with governmental support, will be capable of recruit as well as to finance a permanent doctor and nurse respectively. Thokarpa Village Development Committee (VDC) will be responsible for running and maintaining the village health post, for administrative staff, for paying salery to at least one health worker on duty and, with help from Maitreya Foundation (MF) for required drugs. 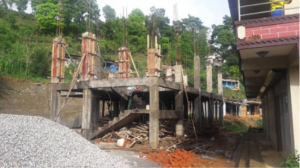 The piece of land that the village has made available for this health post is owned by the village, and of greatest importance in the negotiaion has been that the health post onwoards will be owned and run by Thokarpa village itself. 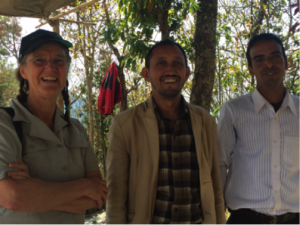 MF, a locally established small Nepali NGO, will actively support the VDC in these matters. 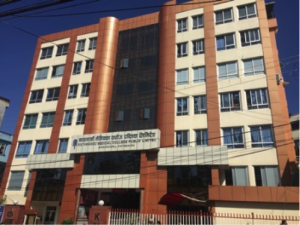 Kathmandu Medical College Public Limited (KMC) is a privately owned and run University Hospital and one of Nepal’s best established and highly ranked. Through KMC’s education program for doctors and nurses, a SIDA-financed, now running into the 12th year, collaboration program has been going on working together with Linköping University, Sweden. 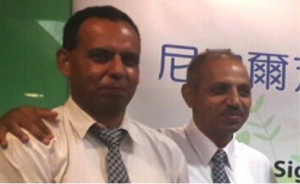 The aim of this collaboration is to introduce a specific type of pedagogical method for learning, to be used at KMC. This program is the reason why I personally have had a several year long relation to KMC. 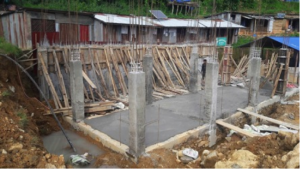 KMC additionally supports and work at another health post, in Sipaghad village in southwestern Sindhupalchowk. 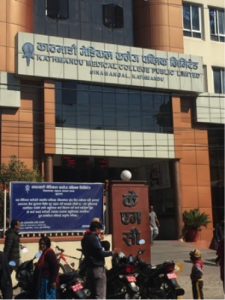 Kathmandu Medical College (KMC) Public Limited has, as part of this University Hospital’s social responsibility, committed to collaborate with MF for providing medical services at Thokarpa VDC health center. KMC will initially supply this health post with one doctor and one nurse aiming at the village itself as soon as possible will be able to run the staffing as well as the maintanence, supported by the government. 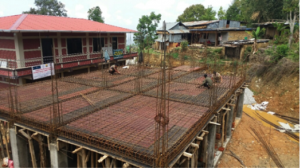 Doctors, nurses and health workers working on this health facility will all be Nepali. The ambition that supplying with manpower, including doctors and nurses, as soon as possible will be dealt with locally through the Thokarpa VDC will be supported by the newly established national programme ”one village, one doctor”. KMC and MF will set up a separate plan concerning this, but will all still be included in a not less than 10 year collaboration. KMC has approved not to claim a patient fee exceeding the governmental, and will according to this work non-profit in Thokarpa. KMC has as well signed up for offering Thokarpa health post patients 25% discount on inpatient hospital care and all kinds of medical investigation and/ or treatment needed to be performed at the KMC Hospital in Sinamangal, Kathmandu, or in it’s affiliate, the KMC run hospital in the geografically closer located Duwakot. 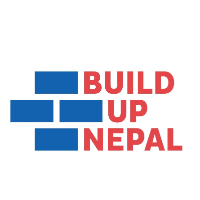 Build Up Nepal is a non-profit company mainly working with rebuilding in earthquake affected remote areas. Build Up Nepal has the ambition to teach the village people better techniques for construction and entrepreneurship, fighting rural poverty. 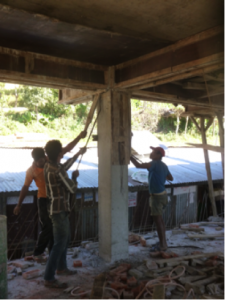 This is maintained by teaching and training local manpower and by using locally collected building material. 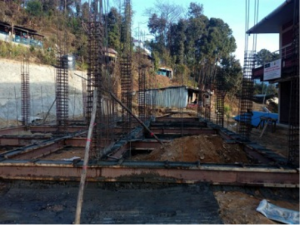 For Thokarpa health post approximately 60% of the material used for constructing the building will be taken from the Thokarpa surroundings. For learning more about the details concerning this technique, construction of so called ”earthquake resistant earth bricks”, and for it’s resistance facing possible coming earthquakes, please visit Build Up Nepal’s web site www.buildupnepal.com. 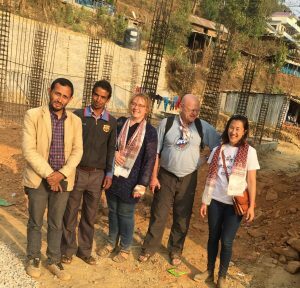 The managing director of Build Up Nepal, Björn Söderberg, is a member of SNS and will through this project personally work without salery. 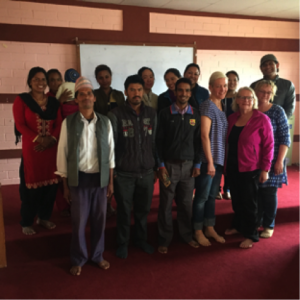 Sweden Nepal Society (SNS) will finance the health post building itself. 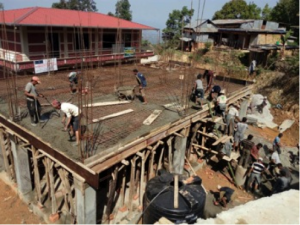 For this purpose SNS has separately signed up with Björn Söderberg and his company Build Up Nepal, which is already established and running in Nepal rebuilding villages in remote areas. SNS will finance a staff building next to the health post and as well has the ambition to be able to finance basic medical equipment for this health post. 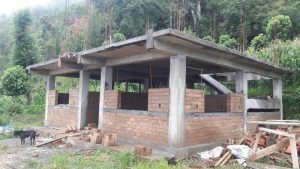 SNS will, after the health post is finished, donate the earth brick machine to the village, in purpose of supporting rebuilding and reconstruction of other parts of the village and it’s surroundings. The main outlines in this collaboration consists of SNS financing the building and KMC staffing the health post with one doctor and one nurse, until the health post has been handed over to the village itself. 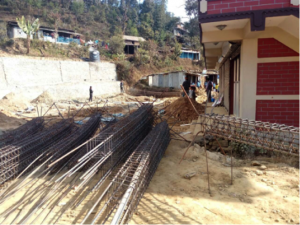 Thokarpa VDC will be the owner of this health facility, including the piece of land, and run the maintanance with support by Maitreya Foundation. During the last year, since the start of this project in early June 2015, many thorough discussions has been held between our collaboration partners, including different ideas and ambitions concerning practical challenges as well as general collaborational matters. 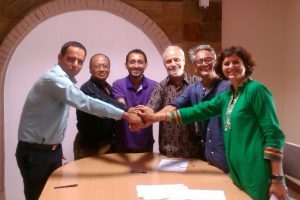 After one year of negotiation and planning, mainly located to Kathmandu, the Four Party Agreement, upon which this collaboration will be grounded, was finally approved upon and signed June 28th 2016. 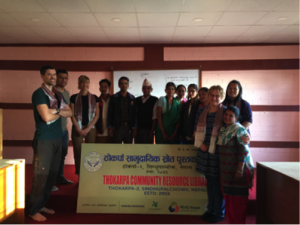 The Sweden Nepal Society (SNS signing up separately with Build Up Nepal), Kathmandu Medical College (KMC), Maitreya Foundation (MF) and Thokarpa Village Development Committee (Thokarpa VDC). 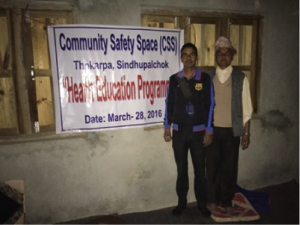 Choosing Thokarpa Village has been made in collaboration with Kathmandu Medical College with support of information from the District Public Health Office, Sindhupalchowk Red Cross District among others. This area was pointed out as one not covered by the major NGO/ INGO’s earthquake rebuilding projects. 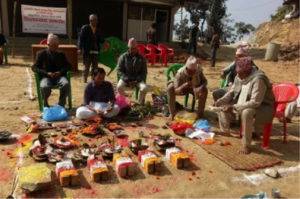 Thokarpa has a previous history of working active and well together, and acted successfully as Nepal’s first pilot village in the major forestry project ”Nepal Community Forestry” more then 40 years ago. 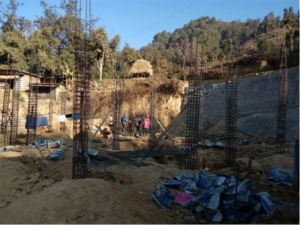 The Thokarpa resident’s ambition and interest in a collaboration project has been as obvious for me as for Katak Malla (the SNS chairman) and KMC. Thokarpa village has itself 6 000 inhabitants, out of which a vast majority has chosen to stay in the village after the earthquakes. 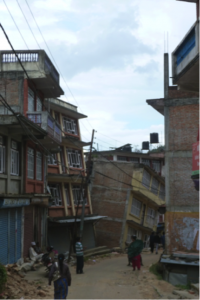 This differs from many other severely earthquake affected areas, from where the majority of the adult population has had to move to Kathmandu or other areas searching for a new future. 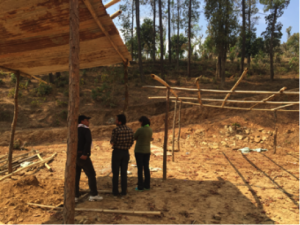 The hope and the ambition to get together rebuilding Thokarpa village is obvious. 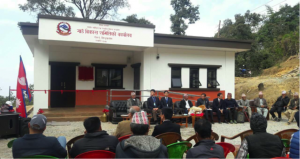 Together with the surrounding villages Kalika, Sunkhani, Lisankghu and Simtali, the total amount this health post will cover, offering primary health care, is 25 000 people. 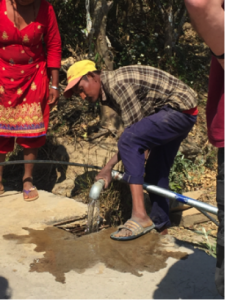 Thokarpa has previously had a dysfunctional small health post, in between being run staffed with one single health worker who has reguarly been working without electricity and with poor water supply. 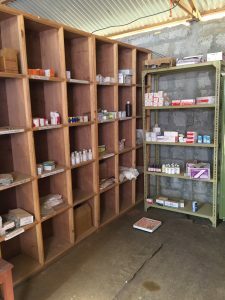 The population in this area has never before had regular access to any doctor, any nurse or any kind of pharmacological support, inclucing basics like paracetamol. 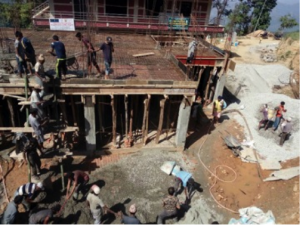 Aiming contributing to a long term relief effort in a Nepali disaster area, I’ve together with the Sweden Nepal Society (SNS), Kathmandu Medical College (KMC), Maitreya Foundation (MF) and Thokarpa Village Development Committee (VDC) since June 2015 been working on a collaboration project concerning building and running a health post in Thokarpa in southern Sindhupalchowk. 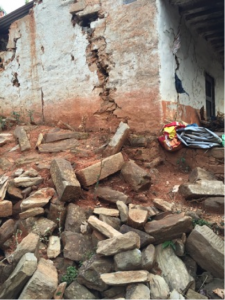 Approximately every third of the deceased related to the earthquakes came from Sindhupalchowk (3000/ 9800). The amount of injured was great as well, but out of a Western perspective relativelly few were reported, due to economical, practical and geographical reasons among others, making the affected patients not being able to reach any health care facility and therefore not being registered. Instead many affected and hurt chose to handle their fractures and other kind of traumatic injuries, physical as well as psycological, by themselves in their home villages. The stories I’ve been told in these areas after the earthquakes are unique. 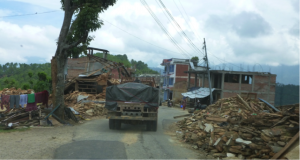 Sindhupalchowk is one of the Nepali districts most severly hit by the earthquakes. Less then one house out of one thousand remained non-affected in this area after the quakes. The village residents are since living under truly harsh conditions with only tin sheds and simple and interim device to protect against the snow, wind, sun and monsoon rain. 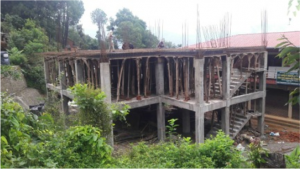 62 out of 68 of Sindhupalchowk's health posts were too badly destroyed to be able to reuse or renovate. A health post is what the primary health care setting is called, which is avaliable to Nepali people living in rural areas. This is usually staffed with health workers and, in the best of cases, a nurse and/ or a doctor as well. April 25th 2015 Nepal was irreversibly changed. The major earthquake and it’s aftershocks completely ruined huge areas in the mid hill Himalayas in approximately 10 different districts, mainly in the central part of Nepal. 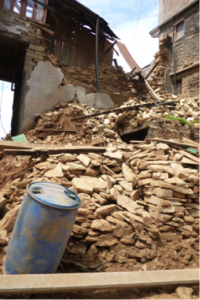 The devastation following the quakes are still extensive, and adding the scenario of a domestic incapability to coordinate different national as well as international relieve efforts, it will take Nepal many years to fully recover. 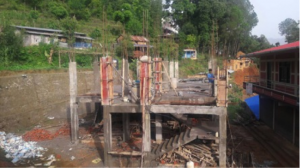 One and a half year later the rebuilding had hardly even begun and the extent of help needed are continously widely spread. 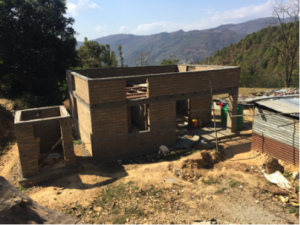 Join us building a health post in Thokarpa, a severely earthquake affected village in Sindhupalchowk, Nepal. Föreningen har öppnat ett swishkonto med nummer 1236335830 enbart för hälsoprojektet i Thokarpa och namnet som kommer upp är SNF hjälpverksamhet. Ni kan även sätta in pengar på föreningens postgirokonto 649 52 42-7. Eftersom detta konto är gemensamt för flera projekt bör ni märka bidraget med Thokarpa samt avsändare.